Our team of thinkers and writers at the Colson Center are archaeology nerds. Seriously, we get giddy whenever another archaeological discovery sheds light on biblical narratives or confirms their historical accuracy. And even more fun, it seems to happen all the time these days. Keep in mind that biblical faith is grounded in historical events, events to which the Bible testifies. This is one of the factors that sets the Bible apart from other religious texts. Recently, two announcements made illustrate the truthfulness of Scripture, one in a spectacular way and the other more quietly. The spectacular illustration was the subject of a recent presentation at the annual meeting of the American Schools of Oriental Research, held here in Colorado. At the meeting, Archaeologist Phillip J. Silva of Trinity Southwest University reported on what his team found in Jordan just north of the Dead Sea. "Samples from the site show that an extremely hot, explosive event," in all likelihood an exploding meteor, "leveled an area of almost 200 square miles including the Middle Ghor - a circular plain to the north of the Dead Sea." The blast not only destroyed "100 percent of the Middle Bronze Age cities and towns" in the area, it rendered the area unsuitable for agriculture for about six centuries. Now unless you dig things blowing up, you might be wondering "What's the big deal?" After all, in 1908 a similar blast in Siberia leveled more than 500 square miles. Well, what makes this "extremely hot" event extremely cool is the location and the date. Silvan and his team are convinced the site of "the explosive event" is the biblical Sodom and Gomorrah, and that it occurred around 3,700 years ago, which is about the same time that Abraham and his nephew Lot were sojourning in the area. 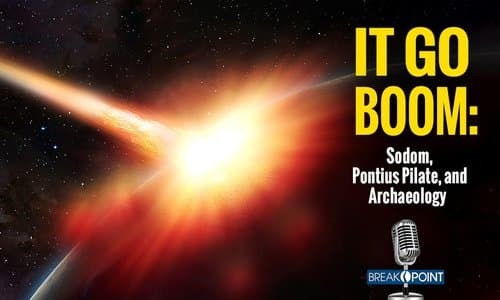 While Silva's discovery can't tell us whether, in Forbes' words, "someone, perhaps a deity, [ordered] an asteroid hit on Sodom," it's yet another reminder that the biblical writers were not making things up. They purposely wrote of historical events that took place in the real world, not in some mythical setting. Now many scholars doubt that Sodom ever existed, much less that it was destroyed in some divinely-ordained cataclysm. This puts us a bit closer to establishing that it did exist and that it was destroyed in a cataclysm around the time the biblical narrative reports. Less spectacular but not less important was another discovery of a ring bearing the inscription "of Pilates" in the ruins of Herodium in the West Bank. The ring was excavated in 1969, but only recently did advanced photographic techniques enable researchers to read the inscription on it. Unlike Sodom, Pilate's existence was never in doubt. The discovery of the "Pilate stone" in 1961 convinced researchers that New Testament references to the Roman prefect who ordered Jesus' crucifixion weren't made up. Still, apart from the New Testament and the writings of the first-century Jewish historian Josephus, we know very little about Pilate. Part of the significance of this discovery is where Pilate's ring was found: in the ruins of Herod's fortress, hence the name "Herodium." And so, we have physical evidence of two biblical characters carrying on in the way the New Testament tells us that they did. Another word for that is "history." Both the Apostles and Nicene creeds assign Pontius Pilate a central role in the story of our salvation. He's one of only three people named in the creeds along with the Virgin Mary and our Lord. It's obvious why the latter two are in there, but why is Pilate included? Because the reference to Pilate anchors our confession in human history. Jesus did not suffer, die, and undergo burial in some gauzy "once-upon-a-time," but in actual history on the orders of a real person who even left evidence of his existence. Unlike other religions, our salvation is grounded in history, and the restoration for which Jesus "suffered under Pontius Pilate" will also take place within history. In other words, Christianity is the real deal.